BANGI, 9 Oct 2013 – Research by The National University of Malaysia (UKM) indicated that no single method of obtaining data to detect genes that cause breast cancer can be conclusive. 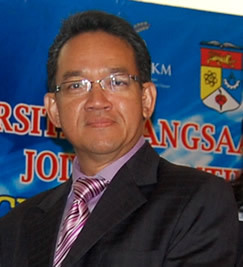 Director of UKM Medical Molecular Biology Institute (UMBI) Professor Dato’ Abdul Rahman Jamal said his research showed that a series of tests, or integrative genomic analysis can be more successful in discovering breast cancer-related genes. Prof Rahman was presenting his paper, Dissecting Breast CancerCarcinogenesis Through Integrative genome Analysis, at the close of the two-day second Asian Regional Conference on Systems Biology (ARCSB), here today. The conference was co-organised by UKM’s Institute of Systems Biology (INBIOSIS). Prof Rahman, who is also Professor in Paediatric Haematology, Oncology and Molecular Biology, noted that several articles had reported data from single profiling studies on different subsets of patients with different results, thus giving wrong conclusions. He said that studies done at the molecular level can give a better insight into the pathway of the disease. Genes are particles in cells, contained in chromosomes and made of DNA (deoxyribonucleic acid). DNA contains the instructions for building proteins. And proteins control the structure and function of all the cells that make up a human body. He said a focus group of breast cancer patients were analysed by several methods, including DNA methylation, gene expression and copy number variation (CNV). CNVs – a form of structural variation — are alterations of the DNA of a genome that results in the cell having an abnormal number of copies of one or more sections of the DNA. CNVs may indicate the presence of cancer-producing cells. DNA methylation is a process that plays a crucial role in the development of nearly all types of cancer. Gene expression is the process by which information from a gene is used in the synthesis of a functional gene product. Prof Rahman together with another researcher Dr Norfilza Mokhtar recruited 87 women for the study with an average age of 55.9 years old. As normal breast tissues were difficult to obtain, they used a ratio of 1:3 of normal and cancer tissues. Each of the datasets were compared in pairs, followed by an integrative analysis of all three datasets. He concluded that the study showed that the highest accuracy of cancer gene testing was obtained by the integrative analysis of all three datasets when compared to the tests done in pairs. He also admitted that more experiments needed to be done, in order to provide a better statistical outcome of the tests. Researchers with better equipment in developed nations may be able to help, he said. However, the best form of treatment for cancer is prevention. He advised women aged forty and above to submit to mammogram tests. Mammography is the process of using low-energy X-rays to examine the human breast and is used as a diagnostic and a screening tool. The goal of mammography is the early detection of breast cancer. About 5% to 10% of breast cancers are thought to be hereditary, caused by abnormal genes passed from parent to child. Prof Rahman explained that analysing the genes that cause breast cancer is quite challenging because it is a heterogeneous and phenotypically diverse disease. This means that it involves many kinds of genes interacting with each other which produce characteristics that are quite complex and diverse. Breast cancer is the most frequent form of cancer found in women not only in Malaysia but the whole world. However the reason that it kills more women in this country proportionally compared to the developed nations is because the patients only seek treatment when it is already too late. Some 30 participants from Malaysia, America, Belgium, China, Australia, the Philippines and Singapore attended the second ARCSB conference. More than 20 research papers were presented.